Baskets of blueberries are rolling in from Michigan, one of the top producers of America’s favorite summer berry. Now touted as a superfood, everybody loves blueberries. They’re sometimes a bit bland, but they are good for us and we prize them. The blueberries shipped in from Chili and beyond that we find in the supermarkets in winter have little flavor, but those fresh off the bush that we see in our summer farmers markets are now at their tastiest peak. Just picked ripe blueberries bursting with juice are perfect for eating out of hand, sprinkling on cereal, adding to a salad or baking into a pie. Their tender gentle sweetness charms us all. Before I ever had a slice of blueberry pie, I’d enjoyed blueberry muffins. 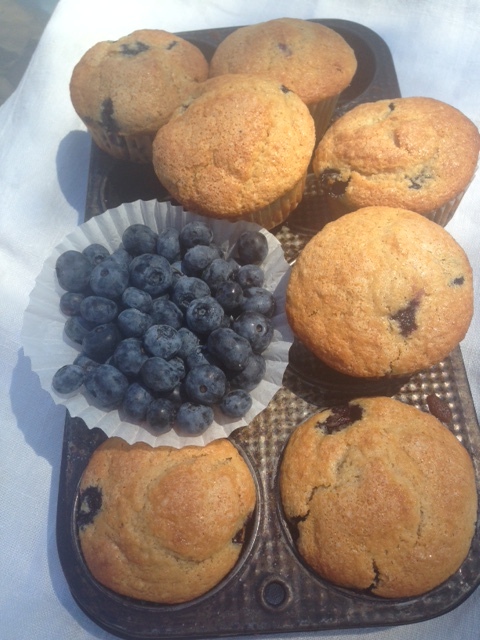 Somehow back decades ago in the Southwest we found them frozen and were treated to my dad’s freshly baked (from scratch, of course) blueberry muffins on Easter morning after the sunrise service up on the Colorado National Monument. Although I enjoy the berries raw. I think they are at their peak of flavor when cooked. Blueberries in a pie, a cobbler, a sauce or in muffins take on a richer dimension of deliciousness. Muffins have almost become cupcakes. The traditional stir and bake breakfast muffins in my mother’s 1942 Inglenook Cookbook have 1 tablespoon sugar for each cup of flour while our current standard muffin recipes average 6 tablespoons of sugar per cup of flour. The following easy recipe at least bumps up the nutrition quota with wholewheat pastry flour and plenty of berries, but admittedly it’s a cupcake. My granddaughters like them for breakfast, but I prefer them for a teacake. These muffins keep well for a couple of days in a tin or may be frozen for a few weeks. Preheat oven to 400°. Line 8 large or 10 smaller muffin cups with cupcake paper. Or grease and flour muffin cups. Melt butter, cool to warm. Sift flour(s), baking soda, baking powder, salt and sugar into a deep mixing bowl. In a large measuring cup whisk together the egg, milk, yogurt, vanilla and cooled melted butter. Make a well in the center of the dry ingredients and stir in the egg mixture in a few quick strokes. Mix in the dry blueberries with the last traces of flour. Spoon the batter into the muffin cups, sprinkle the tops with pinches of sugar for a glaze and pop into the preheated oven. Immediately reduce the heat to 375° and bake for 20-25 minutes depending on size or until muffins are golden and test done. Remove from oven and cool on wire rack. Makes 8-10 muffin. Each spring I spade my garden plot, sink in promising tomato plants and wish for baskets of ripe red fruit. I’m ready to cook through fantasies of the Italian table. Along the way I tuck a few cucumber seeds into the ground near the obligatory summer squash. One year there’s a blight, then a drought, then critters, and I’m usually left in August with scarcely enough tomatoes to garnish a few salads. Meanwhile the cucumbers thrive. We have green gazpacho, salads, quick pickles, wilted cucumbers and cucumbers to give away. Cucumbers grow profusely, and the one tiny plant near my garden fence has now crested its 8-foot stake with fresh vines tumbling over the patio. An abundance of the vegetable allows me to pick them young and fresh each day. I still long for tomatoes, but we’ll enjoy the cukes . Early in my foray into spicy foods, I learned the balance of tangy yogurt. Yogurt with its naturally fermented sour is the perfect foil to anything peppery or bland. Its tartness lifts and deepens flavor with a dimension often lacking in the standard American diet. We haven’t learned to value the sour, while we add sugar to everything. The glory of yogurt is almost destroyed by sweetening it with jam and fruit until most people think of it as dessert. The tradition of yogurt like buttermilk, sour cream, labneh, etc, was not to be sweet but to refresh. Think of the lift a squeeze of lime brings to a taco or a drop of lemon to a cup of tea. I learned to make raita (rye ta) from Indian friends who called yogurt “curd.When I first tasted it alongside a dish of chana masala, I though I’d found a perfect match. It’s so good with almost everything that a simple raita makes its way to our table alongside grilled chicken or fish, roasted vegetables, baked potatoes, vegetarian bean stews and sometimes just to jazz up a plate of leftovers. I usually prepare the simple cucumber raita in a small mortar and pestle. First I crush a clove of garlic and a couple slices of green chili with a pinch of coarse salt. I mix in some finely chopped green or red onion, cucumber cut in tiny dice, some shredded mint, cilantro or parsley then stir in enough homemade whole milk yogurt to make a nice sauce. I test it for salt, sprinkle over a little ground cumin and there it is. It’s ready right away or easily waits for a few hours. Many other vegetables such as grated carrots or radishes, chopped cooked spinach or potato may be used in place of cucumber, but the garlic, onion and optional chili remain consistent. Last night I thought of simplifying this preparation for someone who doesn’t have a mortar, who doesn’t like to chop into fine dice but needs a sauce in a hurry. The following recipe encourages you to use a microplane and a grater to create the same lovely mixture in fewer minutes. 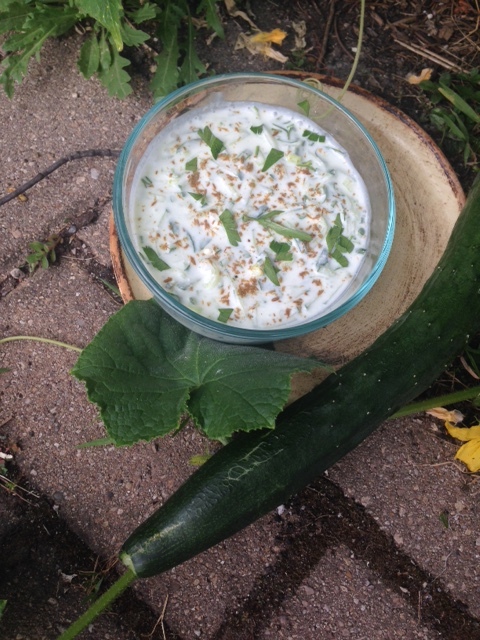 Cucumber Raita is a hot weather remedy for any slump in your summer cooking. It’s health giving, satisfying and tempers the appetite. Peel garlic, hold by root end and grate on microplane into small bowl. Grate in a small amount of green chili (or chop the chili). Add pinch of salt and dissolve salt in grated garlic and chili. Using the large holes of a box grater or the julienne blade of a Japanese mandoline grate in the cucumber. Stir in the chopped onion. (At this point you should have almost a cup of vegetables). Gently stir in whole milk yogurt. Taste for salt. Scrape into a serving bowl and sprinkle with cumin. Serves 2-4. You are currently browsing the Mary Jo's Kitchen blog archives for July, 2016.